Paula Pascual: I love my husband!!! Not because of anything specific, but I have this urge to tell everyone how much I love him. Really. And this is my favorite photo of him, that is why I have use it in three layouts already (last month appear another one in Scrapbook Inspirations). The excuse was the Newbury show, for which I needed some samples using the new Basic Grey Infuse -isn't it yummy? and Sassafras lass stamps. Newbury was a nice show, as always is nice to see so many friends and do some shopping. By the way, I got one of the tools that has been since January in my List: The Bind-it-all. Oh, I am a happy girl (and Omar is too, he looooves notebooks!). Also it was nice too to meet some new faces some of whom actually read my blog. It actually feels kind of weird that people who I never met before are checking what I am doing. But as always, crafters are very warm and affectionate so it's like I have known them all along. Meeting George was great, she is one of this extraordinaries stampers that I met through the Card Inspirations forum. Well, I need to go, I have already prepared tomorrow morning project, but I have to do the afternoon one. I'll post photos on Wednesday. Really excited about mini albums, in case you haven't notice. Edited to say: I have finished the second mini album for tomorrow. 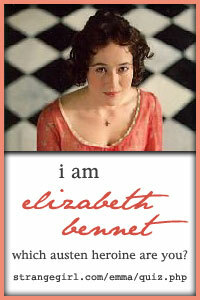 Also I discovered this quiz, and believe it or not I am my heroine, Lizzy Bennet. I do wonder: have I cheated?